As the end of the year draws near, Japan lights up in a dazzling array of winter illuminations to brighten up the dark nights. And it’s not just Tokyo—cities all across the country transform into sparkly winter wonderlands that are guaranteed to put a smile on your face! Here are five of the best. Hiroshima Dreamination is an annual winter illumination event that runs along the entire length of Peace Boulevard, a major street in the center of the city. This year approximately 1.4 million light bulbs will be used to create a stunning variety of sculptures and scenes in different zones on both sides of the road. Each zone has a different theme, ranging from an ocean scene to a frozen castle and a music garden. Dreamination’s city center location makes it really convenient to visit, and the perfect ending to a day of sightseeing in Hiroshima. 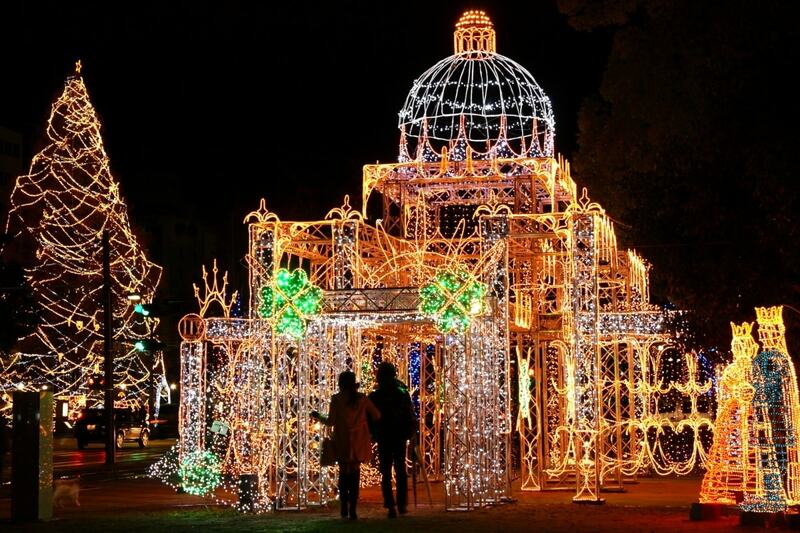 Hours: 5:30 p.m. to 10:30 p.m.
Osaka’s spectacular Festival of Lights is actually a series of illumination events that take place across the city. These include the Midosuji Illumination—a 4-kilometer (about 2.5 miles) river of light along Midosuji Avenue—and the Osaka Hikari Renaissance. The latter features colorful, kaleidoscopic displays projected onto historic buildings, and a 150-meter (nearly 500 feet!) tunnel of lights known as Nakanoshima Illumination Street. Here, the lights synchronise with music to create a dynamic and unforgettable experience. There are also trees styled into champagne glasses through clever light positioning, giant inflatable snowmen and (as to be expected from Osaka) plenty of festive food stalls! With Japan’s iconic Mount Fuji recreated in lights as a centerpiece, there was no way Nabana no Sato Flower Park wasn’t going to make the list! Some of the event’s other most popular features include its 200-meter (about 656 feet!) tunnel of light, created using light bulbs shaped like tiny flowers, and the 120-meter (nearly 400 feet) Great River of Lights. There is also a shorter 100-meter light tunnel which changes color every year to represent a different flower (this year, it’s lavender). Held inside Nagashima Spa Land, one of the more unique attractions is the free ashiyu (foot bath), where you can warm up and rest your feet after you’ve had your fill of the illuminations! 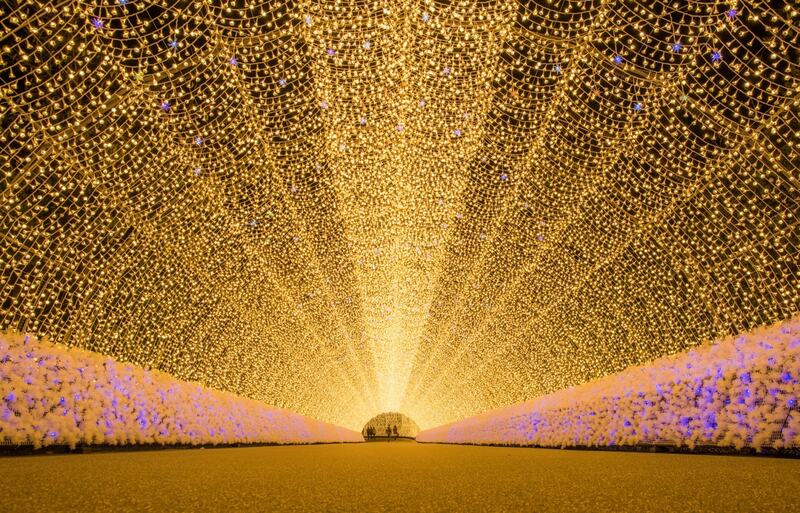 Also known as the Garden of Illuminated Flowers, this illumination event at Ashikaga Flower Park is consistently voted as one of the best in Japan. And with a phenomenal 4.5 million bulbs lighting up the 94,000 square-meter (over 101,000 square feet!) gardens, it’s easy to see why! The illuminations consist of three sequential thematic events: a light and flower collaboration from the end of October until mid-November; Flower Park Christmas from late November to late December; and New Year Illuminations, which last from New Year’s Day until February 5. The park’s flowers are recreated in LED form—including spectacular hanging wisteria—alongside tunnels and murals of light, transforming the area into a magical fairyland. Another of Japan’s top three largest illumination events, the Kingdom of Lights takes place at Nagasaki’s Dutch theme park, Huis Ten Bosch. Created using over 13 million light bulbs, it features a giant robotic dragon, a 30-meter-high (nearly 100 feet) Christmas tree, and a stunning 66-meter waterfall of light. You can spend hours exploring all the different displays, which also include dramatic water-and-light shows, a Christmas market, and a 110-meter (about 360 feet) 3D projection mapping show. With a glass-bottomed café situated above some of the illuminations, it’s basically like being inside a giant art installation—definitely not to be missed!